Meet Our 2016-2017 Class Act Winners! This year Random Acts received a huge number of submissions to its annual Class Act award program. The program inspires schools around the world to carry out acts of kindness in their community, and rewards the most inventive and impactful group with $6,000 for their school. Choosing just six finalists from all of the wonderful entries this year was a tough task. Each of the finalists showed incredible dedication and creativity, but after much deliberation, our team picked a group who worked tirelessly to fill their school with kindness and positivity all year long. 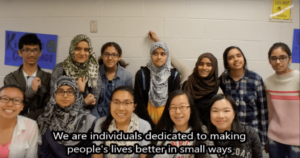 Please join us in celebrating our 2016-2017 Class Act winner, the “Undercover Kindness Club” at Marc Garneau Collegiate Institute in Toronto, Ontario, Canada! Next, Undercover Kindness wrote personal thank you letters to their school’s non-teaching staff, on behalf of all of Garneau’s students. Club members handed out these letters in person to janitors, office staff, cafeteria workers, and guidance counsellors. 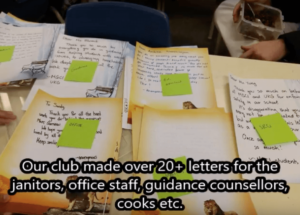 They followed this up by writing notes of appreciation for the school’s 60+ teachers, which were placed in their mailboxes with the help of staff adviser Ms. Woodley. In January, club members took to the hallways to hand out free cookies while carrying signs that said “Kindness is Free.” The following month, they set up a “Heart-to-Heart” booth where students wrote messages on paper hearts to people they care about. The club then used the hearts to decorate the school for Valentine’s Day, helping to share love and appreciationwith everyone at Garneau. But all these amazing acts were just building up to the main event: the Kindness Cafe. “It’s an event that embodies what our club is all about,” said Zainab. “Our team recruited volunteers and set up stations that each showed kindness in different and exciting ways.” These included giant thank you cards for different departments, a positivity-themed photo booth and an “Undercover Compliments” station—the club even treated visitors to free homemade brownies. Congratulations to the Undercover Kindness Club! Your example of generosity will keep others inspired and excited to do some good. This year’s winners weren’t the only ones getting up to exciting things—check out what our runners up accomplished and start brainstorming ideas of your own! Congrats again to all involved! We’re so proud of everything you do.